Some may say that you will never understand the hardships or atrocities our past generations have faced because we have never had to live through them. To an extent, that is true, but that is why we are told stories. Stories have the power to transport us to those events and empathize with everything that happened. They allow us to experience, to a certain degree, the full range of emotions our descendants may have experienced. Their intent isn’t to instill some sense of guilt, but rather to help us remember the events of the past to prevent them from happening again. That is what makes Deborah Lipstadt’s true tale so powerful, and makes Denial a necessary reminder that past mistakes are right around the corner. The visceral effect of visiting the site where so many atrocities happened is completely gut-wrenching. Visiting the actual site of Auschwitz, even though only cinematically, puts everything we have read or heard about the Holocaust into context. This was one of the most devastating scenes in Denial and helped set the tone for the rest of the film. That overpowering tone is outrage. Realizing that there are still people out in the world that deny the irrefutable fact that the Holocaust ever happened is infuriating. That would be like someone arguing that the Earth is at the center of the universe, or that the Earth is flat, or that not vaccinating your children is actually better for them. Think of it like a completely unqualified man, running for one of the most powerful positions in the world while throwing out unsubstantiated claims, yet ignoring the undeniable facts and statistics that are one simple Google search away. Yes, it is maddening and mind-boggling to think that as humans we haven’t evolved to a greater state of intellectual enlightenment at this point and that some of us still entertain the ideas of the David Irving’s and Donald Trumps of our generation. Watching the film is every bit as frustrating as you think it is. How any government let this farce go on as long as it did is not only important but completely relevant in our current political state. The comparisons to Trump are staggering, and that’s what gives this film such a breath of contemporary relevance. More than that, the film is a reminder of the horrors of the past and how we are well on our way to repeating them. The biggest comparison Denial subconsciously makes comes in the form of comparing Trump’s current campaign for president and Hitler’s rise to power. Both use hate and fear to garner support and fan the embers of dormant xenophobia that people in this country still hold on to. The only difference is that instead of Jews, Romany, and homosexuals, Trump would target Muslims (or people who look even vaguely Middle Eastern), Mexicans (or anyone that looks at all Hispanic), and homosexuals (or anyone who deviates from heterosexuality). The comparisons between Hitler, Irving and Trump are undeniable, but at the center of Denial is the very real story of a woman trying to fight against a Holocaust denier in a country where the burden of proof is on the accused rather than the accuser. Deborah Lipstadt (Rachel Weisz) has the monumental task of not only defending herself but defending an entire group of people whose lives were lost or greatly affected by Hitler’s genocide. Screenplay writer David Hare has experience adapting Holocaust-themed novels into equally compelling films, much like he did with The Reader. Hare highlights the central theme of historical fiction created by the losing side as a way to make us think about where our own knowledge of history comes from. Hare also fills every situation with intense disgruntlement for both the characters and the viewer. Even within a fairly straightforward story, he manages to weave ethical observations showing how Lipstadt’s understandably extreme emotional connection to the case could be a liability. The film acknowledges that while passion is a powerful ally, cold logic needs to be at the base of every argument. Only having passion with little to no logic is what leads people to follow the likes of Hitler or Trump. 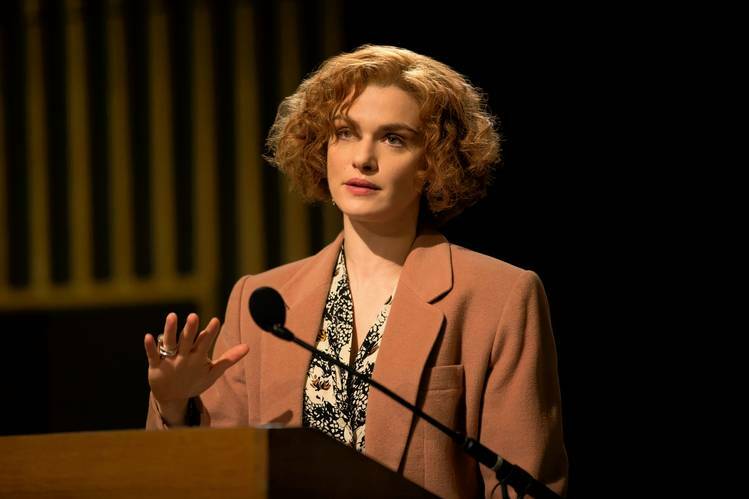 Director Mick Jackson does his part by recreating the environments and sets to match the period, but with the restraint so as not to take away from the film’s real star: Lipstadt. Everything from the color palette to the cinematography is so basic that it feels completely authentic and natural. There are no flashy scenes to take away from the clear message about how Irving’s bravado and showmanship was used as a means to pull in the masses without offering anything of substance. The filmmaking practices what it preaches by using a humble visual aesthetic to emphasize the film’s meaning. That includes the unforgettable scene at the concentration camps. The entire cast gives a monumental performance that does justice to this monumental story. As a whole, they worked like a finely tuned clock. At the head, we have a great performance from Rachel Weisz, who has had a phenomenal year and deserves an Oscar nomination for channeling every nuance and mannerism of her character. Timothy Spall is an actor that continues to impress as he did in one of my favorite films of 2014, Mr. Turner. He plays David Irving to perfect by giving him a deeper layer beyond his villainous exterior. Everyone, from the legendary Tom Wilkinson to the fantastic Caren Pistorius, come together and deliver a story that is bigger than themselves. Their actions echo and ring twice as true in our society, where in less than a month we will all need to band together and vote for the betterment of not just our society, but our world. Next ArticleThe Guardians of the Galaxy Vol. 2 Teaser is here! Obviously.